The Truth About Music » MS MR Release "Fantasy"
Opening with just organ and piano chords and a few oohs from the Missus in MS MR (I still can”t find their real names anywhere–amazing they can pull this off in the age of Twitter and Instagram), “Fantasy” slowly builds, adding handclaps and subtle effects before opening up into an explosion of huge drums. Combined with the emotive vocals and background chants, it sound lush, tribal and almost romantic. 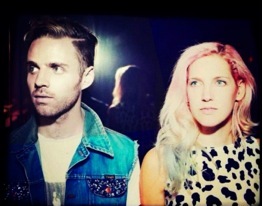 Fresh off two sold out shows in NYC as well as in L.A., MS MR will also be making their debut at SXSW in Austin. Listen to “Fantasy” here. Second Hand Rapture comes out May 14. New Music: The Asteroids Galaxy Tour "Major"